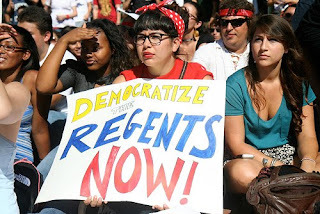 At a recent meeting on the UC Budget cuts, a Berkeley professor mentioned that one of the faculty unions is interested in thinking seriously about ways of reforming the Board of Regents. Prof Laura Nader Calls for More Accountable Regents at one of the roundtables/teach-ins in the run up to the walkout. See the youtube video. 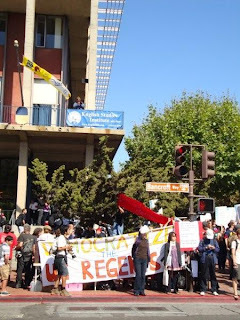 UC Democracy was a prominent theme amongst the demonstrations throughout the UC system today. UC Democracy was added recently to the agenda at a General Assembly meeting focused on organizing the walkout. UC Democracy was featured on the main poster advertising the walkout. Democratic process was heavily emphasized during the meeting of the General Assembly today after the march, and UC Democracy was mentioned as an agenda item in moving forward.